With wine there is probably more room for personal interpretation and opinion than in any other area of gastronomy. The sheer variety of wines available from across the globe encourages this, but the reputation of the wine connoisseur and his often ridiculous descriptions of the perfumes to be nosed out of the glass makes wine-tasting seem a spurious and silly pursuit to some and downright intimidating to others. So, while the tasting notes accompanying a bottle of Campo Viejo 2010 Tempranillo may suggest flavors of blackcurrant, licorice, baking spices and earth, and taste to us pleasantly of the sawdust of the tannery floor or of plums on the branch, the reader may feel free to disagree and suggest their own playful similes. Or, alternatively, disagree and say that it’s rotten stuff and not worth drinking. Similarly, they may question our motives entirely at recommending a wine of which we were offered a free trial. And that would be perfectly acceptable too. What is beyond dispute though, is that Campo Viejo is, and has been, Rioja’s premier bodega for at least the last forty years, and that Rioja itself, in spite of competition from a host of up and coming growing areas around Spain, most notably Priorat in Catalunya, Duero in Castilla y Leon, and Yecla in Murcia, remains the standard against which all Spanish red wine is judged. Even prior to Spain’s re-emergence as a gastronomic powerhouse, Riojan wines were garnering plaudits for their leathery, tannic quality which gave them a wonderful mouth-feel and classy, dry bouquet but which didn’t weigh down the palate. And, for generations before that many of Bordeaux’s more famous houses supported the fruit forward reputation of this region’s wines importing tempranillo from Rioja to put meat on the bones of their medoc and cabernet sauvignon blends in years when it was thin and weak. Founded in 1959 in the stark countryside outside of the regional capital of Logroño, Campo Viejo has been constantly evolving as a winery since then, both in their wine-making techniques and styles of wines produced, and with their new and stunningly modern facility. 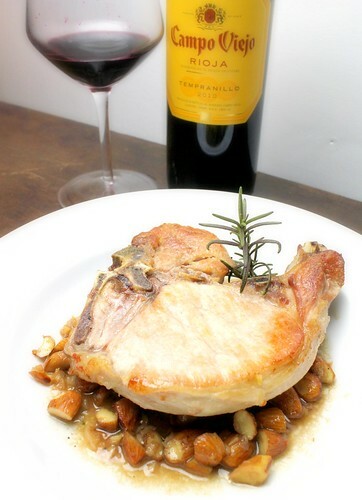 Best known for its line of crianzas and reservas, aged at least 12 and 18 months, respectively, in oak barrels, Campo Viejo’s 2010 Tempranillo represents a new style of younger, non-oaked wines for this esteemed house that winemaker Elena Adell has designed to be fruitier and more generous. Whether you like this style is entirely up to you, it is a marvelous coincidence that we received a free sample and did end up liking it a lot. Even had we paid for it, at $9.99 it is at the right price point for every day drinking and competes directly in that price and style bracket with many of the regional wines coming out of Portugal these days. 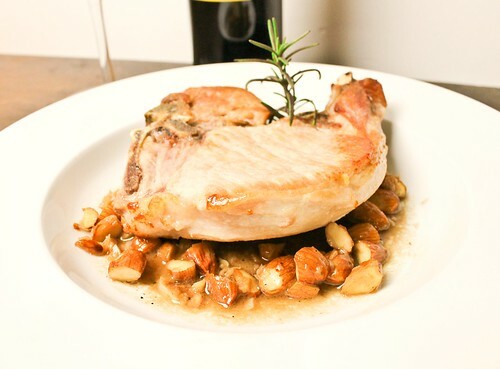 To test its appropriateness for the simple flavors of a weeknight meal, we made an extremely straightforward, rustic Andalusian dish, pork chops in the style of Jerez, pan frying the chops and then making a light sauce of dry Oloroso sherry, minced garlic and roughly chopped almonds. The two worked nicely together and we would recommend trying them together. Again, readers are encouraged to exercise their own judgment over whether they agree. 2 medium pork chops (about 1 inch thick), bone-in. In a 10 inch skillet, heated to medium-high, add olive oil and then well-seasoned pork chops. Cook on both sides until well-browned, about 7 minutes total, before removing to a plate. Add garlic to hot pan, cook briefly, 1 minute perhaps, add almonds and stir well. Keeping heat on medium-high, add sherry and after another minute, add chops back to pan, along with any meat juices on the plate. Cover with a tight-fitting lid for 3-4 minutes. Taste sauce, correct seasoning. Serve with poor man’s potatoes or, even better, patatas a la Riojana and a glass of Campo Viejo Tempranillo 2010. @Peter: we know you want us to say “yes, we missed you”, so there you go, but if truth be told, we actually did. There is a line in “Wine for Dummies” where they do make a joke that people do tend to make way too big a deal out of a glass of fermented fruit juice. I like to say, “How come no one ever says a wine taste like grapes?” I have not drunk my rioja (except for use in sangria…) so you have given me some food (well, drink really) for thought on new wines to try. Thanks for stopping by my blog and for the sweet comment. The chuletas de cerdo looks absolutely scrumptious! Amazing combination of flavors 🙂 Have a great day! Starting a Spanish theme on my blog and these recipes are so inspiring. The pork meat in Spain is just amazing and you really have done any pork meat justice here. Riojas are always a sure bet. A delicious dish familia!!! ← Adobe Lightroom: You Can Put Lipstick on a Pig!